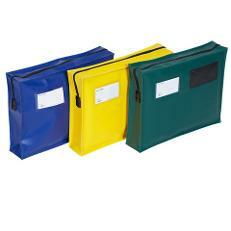 These larger, heavy duty, reusable security pouches, have an all round gusset of 76mm, making them suitable for bulk documents etc. Featuring a clear internal address label pocket and external stamp/label patch, they combine a tamper evident zip lock, with either plain, colour coded or sequentially numbered security seals and are available in two sizes with a choice of colours from stock as below. Item # GP3=406mm x 305mm x 76mm £13.50 ea excl VAT and carriage. Item # GP4= 457mm x 330mm x 76mm £15.00 ea excl VAT and carriage.